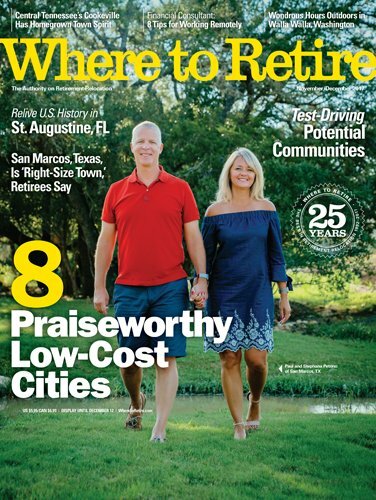 Houston, TX (Oct. 3, 2017) – Pueblo, CO, has been selected a top retirement destination by Where to Retire, the only magazine in America geared toward helping people with retirement relocation decisions. Pueblo is profiled in a feature titled “8 Praiseworthy Low-Cost Cities” in the November/December 2017 issue, available nationwide on Oct. 10. Where to Retire Editor Annette Fuller said many relocating retirees choose a destination with a low cost of living. “Retirees love nothing more than to flee cities with high prices and land in a place where money has a long shelf life. Put beautiful scenery into the mix, like Pueblo’s Rocky Mountains backdrop, and there you have it. These eight cities keep costs low and satisfaction high,” Fuller said. Where to Retire, now celebrating 25 years in print, is published six times a year. The magazine covers the best retirement regions, towns and master-planned communities, and recently released its 10th biennial list naming the 50 best master-planned communities in the U.S. It has a national circulation of 200,000 and is sold on various newsstands and at Barnes & Noble bookstores. A one-year subscription is $18. All material in the magazine is protected by copyright law, and reproduction of content requires the permission of the magazine. Print and electronic reprints of an article may be purchased through Dave Hart. Request free information from our advertisers here.